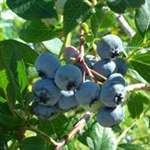 Bluecrop was, for many years, the most widely planted blueberry in the world and for good reason. It is easy to grow and mostly disease resistant, but does have a tendency to over produce its branches, so it benefits from Summer pruning in addition to the normal winter cutbacks. Pinch out the growing tips of new growth during the early summer to prevent it forming very long 'canes' and to encourage fruit-bearing side shoots. The plant is upright, open and vigorous and will reach a height of 1.5 - 1.8m (5-6ft) in the open ground, and has excellent red autumn colour. The fruit forms in clusters, with large, firm berries which are resistant to cracking. The flavour is good to excellent and the berries can be kept in the fridge for 2 weeks or more. Web site brilliant and helpful. Very good service. I bought the Blueberry 'Bluecrop" for a birthday present and was not disappointed. It arrived very quickly in excellent packaging. Very good.pack well.and well informed about delivery .so excellent service. Yet again Trehane has not let me down, they sent me an amazing and well packaged blueberry. I would recommend this nursery for the amazing care they take of their blueberries, also very helpful and obliging. This is the second plant purchased from Trehane. As with the camellia purchased a few months ago the blueberry arrived in perfect condition. An excellent specimen. I'd happily recommend buying plants from Trehane. We had recently order two 5L blueberry bushes, plants arrived looking great, already with some fruit on. Perfect. Plants were so well packaged there wasn't any damage at all.